Mario and friends return to their Karts to race around some all-new circuits in the Mushroom Kingdom. 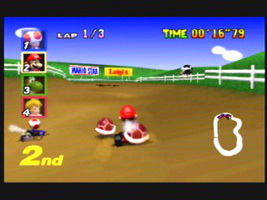 Each character has their own racing stats, such as better top speed or acceleration. Collect items to use against your opponents and pass the finish line in first place. The Grand Prix mode has four cups, each with four circuits. Your earn points for placing fourth or better, and the character with the most points at the end of the four circuits wins the Cup. In Time Trial you play the tracks alone, aiming to get the best time possible. You can save your best times as ghosts to race against later. Up to four players can take place in Grand Prix, or fight it out in Battle Mode, using items to burst your opponents balloons. 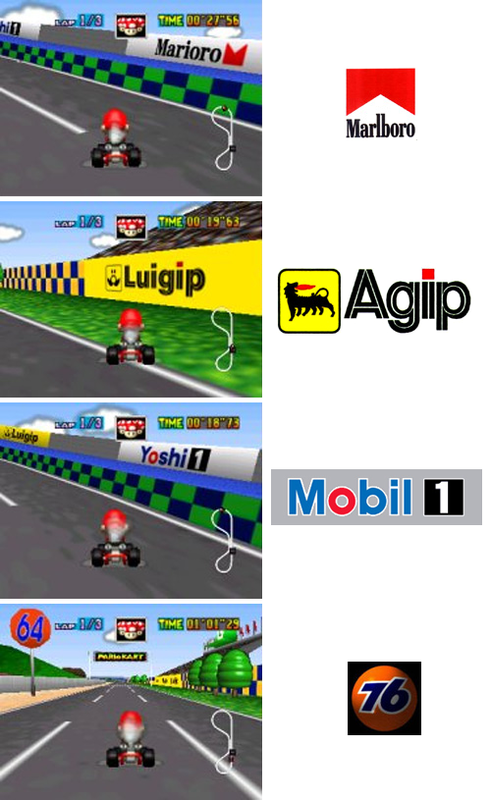 Nintendo slipped some amusing banners into the game, ripping off the logos of various American motorcar sponsors. However, these were restricted to the Japanese version, and the logos were completely changed for the American and European versions.